Every major release if a new web browser comes with lots of activity on technology news site. Everyone aims to be the first to report about something, and some manage to get their copies early for a distinct advantage. Then again, in the end it turns that a huge amount of interchangeable articles flood the web on those days. 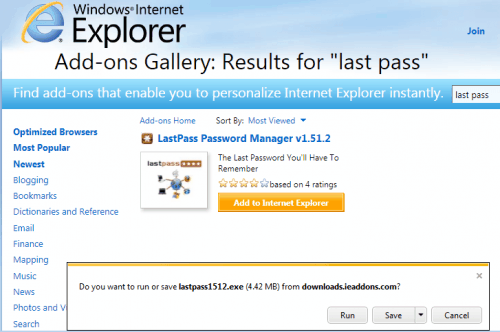 Internet Explorer 9 Downloads, Reviews, Screenshot tours, the usual stuff. 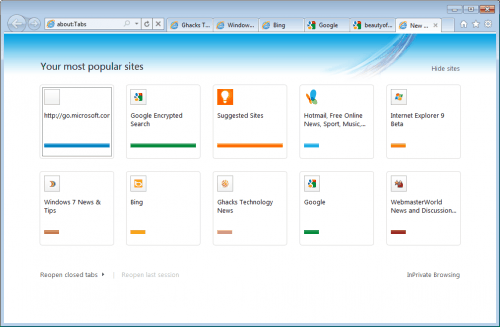 In this guide, we look at the best and worst Internet Explorer 9 features. That's basically all you need to know to decide whether you want to install the browser, or not. Promised. And we keep it reasonably short as well. Performance: Users will notice two major changes in the web browser, and one of them is a big performance boost. The browser loads up nicely and displays websites fast, a lot faster than Internet Explorer 8, and even more so when compared to previous Internet Explorer versions. The browser has closed the gap to every other modern browser that is available today. Yes, some may be a few artificial points faster in that benchmark or this, but Internet Explorer 9 offers a great performance. Page loading times have improved a lot, and the browser feels more responsive as well. That's great and without doubt the biggest plus of Internet Explorer 9. To put it in one sentence: Microsoft has made the browser usable again. 2. Design: The second major change becomes apparent on first start. The browser has a very minimalistic design. The IE development team has basically removed all toolbars, except for the title bar and the address bar. Everything else has been hidden by default, or removed completely. This means that most of the space can be used by websites to display their contents. While it may not make a huge difference on a 24 inch monitor, it can considerably improve the experience on netbooks and other systems with small computer screens. The address bar combines the old search form and the address bar into one form. That's how several other browsers are handling it. The major advantage is that it saves screen estate. 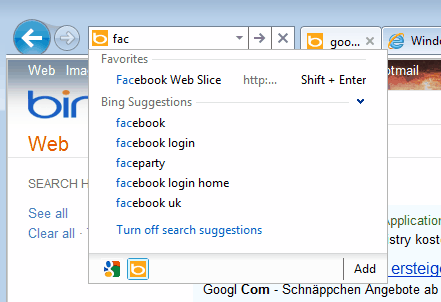 Microsoft has added several interesting features to the address bar. It is for instance possible to switch search engines instantly, enable Bing search suggestions to see suggestions for phrases typed in, and get hits from the favorites and history. 4. New Tab Page: Blank tab pages are so last century. Microsoft finally has added information to the new tab page. 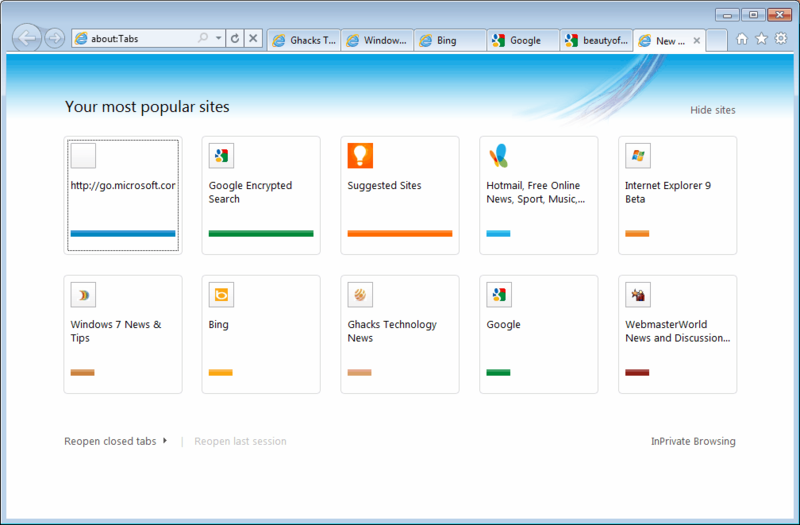 It displays the most popular sites that the user has visited in the past, as well as recently closed sites. There is also an option launch an InPrivate browsing session, and to hide the sites that are displayed on the new tab page. Good for work environments. Finally, it is possible to remove individual sites from the listing. Finally a proper download manager for Internet Explorer. The manager looks similar to the Firefox download manager. It keeps track of downloads during the browsing session, with search options and actions right in the interface. The notifications "The publisher of this program couldn't be verified" may trouble some users though, as they are displayed quite frequently, even for programs that are widely known and popular. 1. Customization: A minimalistic design is great, really. But the options to customize the design are scarce. Sure, it is possible to enable the favorites bar, but there are no options to make use of the space in the title bar for instance. That's a full stripe of blank space in the browser. Another example is the tabbar, which has been placed on the right side of the address form. There is no option to move the tabbar to its own toolbar. Again, not a problem for users who work with ten or less tabs at a time, but users with 50 or more open tabs will soon realize that this design will not work for them. And with all the design changes, one would think that Microsoft would at least combine the Stop and Reload buttons into one to save even more space. 2. Pinning Websites To The Taskbar: This feature has been hyped a lot. 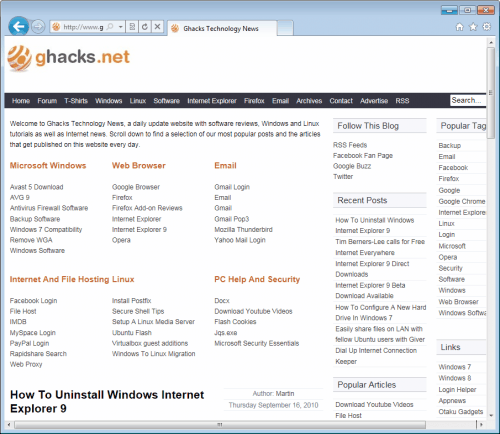 Windows 7 users can drag and drop websites to the taskbar, to pin them there. That sounds good on first glance, but problems become apparent immediately. The major problem is that all add-ons are disabled when a website is opened from its pinned taskbar position. This, and the fact that each site is opened in a new browser window turns that feature into a usability nightmare. Desktop shortcuts created in Internet Explorer 9 seem to be affected by this as well. The only solution is to create shortcuts in other browsers, to use them in IE9. Not good..
3. On Page Notifications: The Internet Explorer 9 team has changed the way notifications are presented to the user. Take a download for instance. 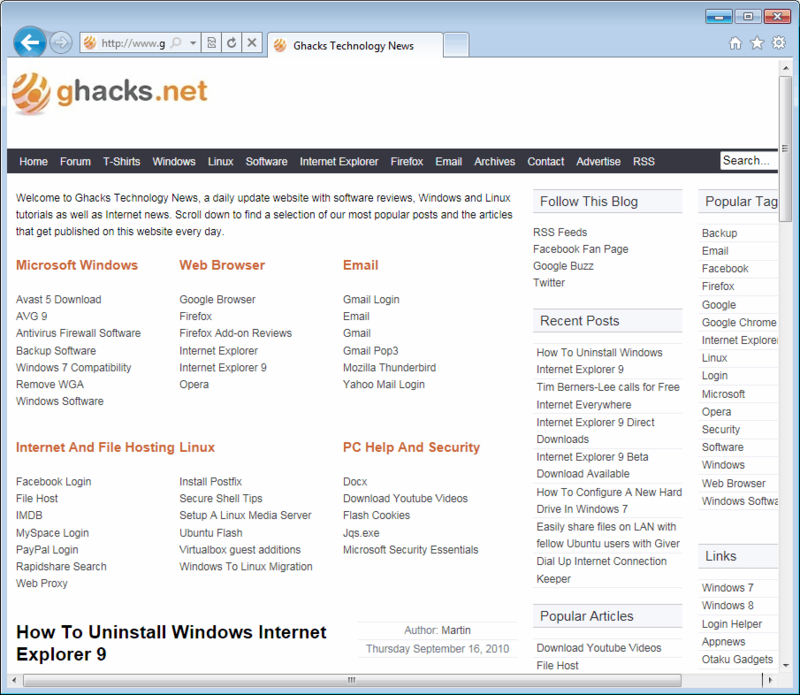 In Internet Explorer 8, and any other web browser for that matter, a popup is displayed. That's a separate window which can be easily identified by the user. Internet Explorer 9 got rid of those popups completely. The browser instead displays the notifications on the same page they have been triggered on. A download notification is only displayed on the one page the file link was clicked on. This can mean that the popup is not noticed by the user immediately, especially if tabs are switched after triggering the action. 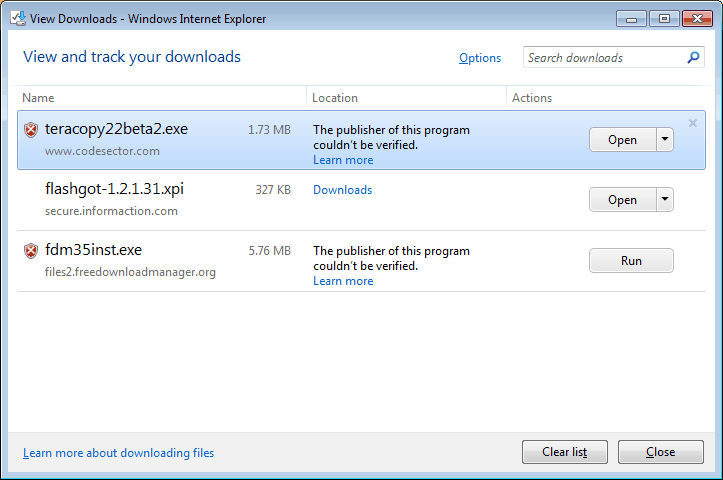 We have to keep in mind that Internet Explorer 9 is still a beta, and not a final release. While it is unlikely that Microsoft will make any major changes to the browser, it is possible that one or the other feature will be improved until then. We surely hope so for our flop 5 features. Still, Internet Explorer 9 is a major improvement over previous editions of the browser. It is on pair with the other browsers in most regards, and shines with a few features that we'd like to see implemented in the other browsers as well. Is it enough to convince users to switch back to Internet Explorer? Some surely will do that, others who bought a new PC may find IE9 sufficient for all their web browsing needs. Die hard Chrome, Firefox or Opera users on the other hand are not likely to switch back. What many will do however is to use the new Windows Internet Explorer browser as an alternative on their system, a secondary browser so to say. Have something to add? Let us know in the comments. If you ask me its Just Like Google Chrome!!!!!!! Its generic Google Chrome!~!! No, since I know Iron (http://www.srware.net/en/software_srware_iron.php) this is my alternative/secondary browser, after Firefox, before it was IE. 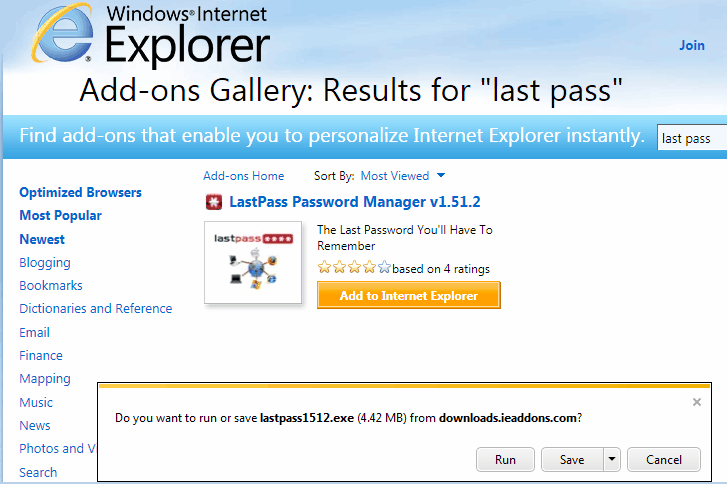 Last Pass already supports Internet Explorer. I would be tempted to switch, if NoScript would be available for Internet Explorer. I also prefer the reload and stop functions consolidated into a single button. It’s convenient, and it’s minimal. However, it fails certain usability tests. Moreover, it can cause some accessibility issues. A button that switches function in context is simple for the average user, but it can be much trickier for certain users who need special accommodations. In this sense, you might want to argue that this is a feature and not a flop. You can pretty much control the entire browser via the Operating System’s built-in speech recognition system. That’s an impressive browser. It looks like a cross between Google’s Chrome browser and Mozilla’s Firefox. I am satisfied with Firefox and will probably not change, but I’m sure this will be an improvement for those who already use Internet Explorer.